Does it feel like you’re carrying the whole world on your shoulders? These days, a busy, fast-paced lifestyle is practically standard and many people struggle with feeling burned out. If you are someone with a lot on your plate, you might have a hard time making time for yourself. However, self-care is important. You simply aren’t going to be able to do everything you want if you don’t take the time to slow down and replenish. If you struggle with self-care, here are some ideas for how you can practice self-care for a happier, healthier you. If you are struggling to make time for self-care, chances are, you haven’t incorporated it into your schedule. You may have a full Google calendar without any “you” time on the agenda. It’s easier to keep up with self-care when you incorporate it into your routine. For example, you could wake up half an hour earlier so you have time in the morning to do something that helps you to be your best self. For example, you could meditate, exercise, make breakfast, or journal. Starting the day in a grounded frame of mind can help you take on everything you need to get done with a positive outlook. One area of self-care that often gets neglected by busy people is sleep. When you have a lot to get done, it can be easy to work until the wee hours. However, getting enough quality sleep has a huge impact on your wellbeing. Ideally, you should get between seven and nine hours of sleep every night. How happy you are in your life has a lot to do with your perception. All of us struggle and all of us have joy, but it is what we focus on that defines how we feel overall. Creating a gratitude practice is a powerful way to create more room for the good in our lives. One simple exercise to create a space for gratitude is through writing down three things you’re grateful for every day. It can be helpful to do this right before you go to bed so you can have a better frame of mind as you’re falling asleep. Sometimes when we give a lot of energy at work, at the end of the day, we just want to veg out in front of the TV alone. However, being connected to other people is one of the most powerful things you can do to feel more grounded. Practice self-care by making time for people who put you in a good mood and who support you unconditionally. It can be helpful to create a ritual around this, such as by having a weekly game night. Massage is a great form of self-care because it offers a variety of health benefits. Massage relieves stress, reduces anxiety, aids in sleep, and promotes relaxation. We recommend scheduling a massage at least once a month to provide you with the pampering you deserve while aiding your overall health. 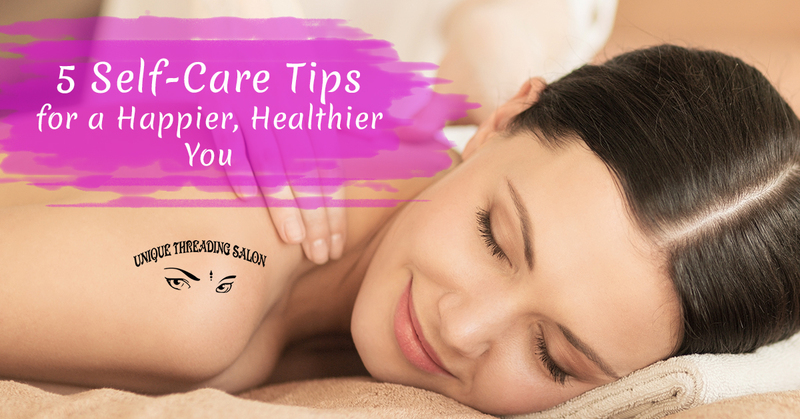 At Unique Threading Salon, we would be honored to play a part in your self-care routine. Contact us today to schedule an appointment with one of our massage therapists in Chelsea.